The formation and structural organization of interpolymer complexes formed by poly(methacrylic acid) chains regularly grafted to polyimide (molecular brushes) and macromolecules of poly(N-vinylamides) with different molecular masses are studied by polarized luminescence. The luminescent label of the anthracene structure is covalently bound to poly(methacrylic acid) chains in a brush. It is shown that in aqueous solutions the complexes under study are stabilized by hydrogen bonds formed between proton donor and proton acceptor groups of interacting chains. The formation of these complexes depends not only on the nature of poly(N-vinylamide) but also especially on its molecular mass. An increase in the molecular mass of polyamide is followed by the formation of a more compact less hydrated structure, as proved by an increase in the time of nanosecond relaxation and enhanced binding of the diphilic organic ion. 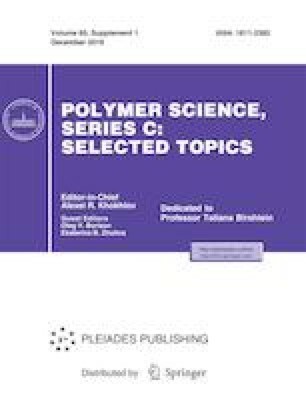 The hindrance of poly(methacrylic acid) grafted chains complexed with polyvinylamide is lower than that of corresponding linear chains. This can be explained by a higher imperfection of the formed double-stranded structures. The ionization of carboxyl groups leads to the dissociation of complexes. The pH range corresponding to the highest degree of binding of acridine orange by poly(methacrylic acid) grafted chains is broader than that corresponding to the highest degree of dye binding by the linear polyacid. Original Russian Text © T.N. Nekrasova, V.D. Pautov, T.D. Anan’eva, T.K. Meleshko, I.V. Ivanov, A.V. Yakimansky, 2018, published in Vysokomolekulyarnye Soedineniya, Seriya C, 2018, Vol. 60, No. 2, pp. 274–281.